We've been a family business based in the heart of Cheshire's chemical manufacturing area since 1977. Over 35 years later our founding principles of fairness, quality and excellent customer service are still very much alive. ReAgent is proud to be a family owned business, now in its third generation. The company was started by Derek and Norma Millard back in the 1970s. Derek was a physicist working for what was then the largest chemical manufacturer in the British Empire, Imperial Chemical Industries, more commonly known as ICI. Derek had the bold idea to set up a small chemical manufacturing business which would supply ICI with a range of analytical chemical solutions, standard solutions and chemical reagents more efficiently and more economically than ICI could produce from its own department. After lengthy negotiations, a number of setbacks, countless sleepless nights and a host of meetings with banks, lawyers and accountants it finally all came together for Derek and Norma when they got the blessing of the ICI top brass to set up their company. So in 1977, taking with them a number of Derek’s ICI colleagues, ReAgent Chemical Services Limited was born. Read more about our humble beginnings in The Birth of ReAgent, through the Eyes of its Founders. Reagent Chemical Services Limited developed and grew as a company, employing more staff and producing a wider range of products to satisfy demand from new customers in a diverse range of industry sectors. 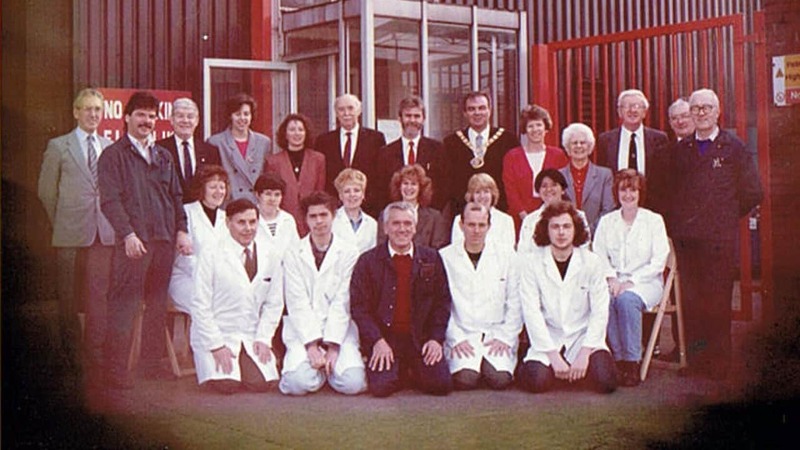 The company was one of the first in the UK to gain accreditation to BS 5750, the pre-cursor to ISO 9001:2008 Quality Standard and the photograph below shows the proud moment in 1982 when the Mayor of Halton presented the certificate to the company. In 1989 Derek and Norma stepped down from their respective positions as Managing Director and Company Secretary, handing over the reins to their daughter and son-in-law, Barbara and Steve Hudson, although Derek and Norma continued with their involvement in the company until their retirement in 2000. 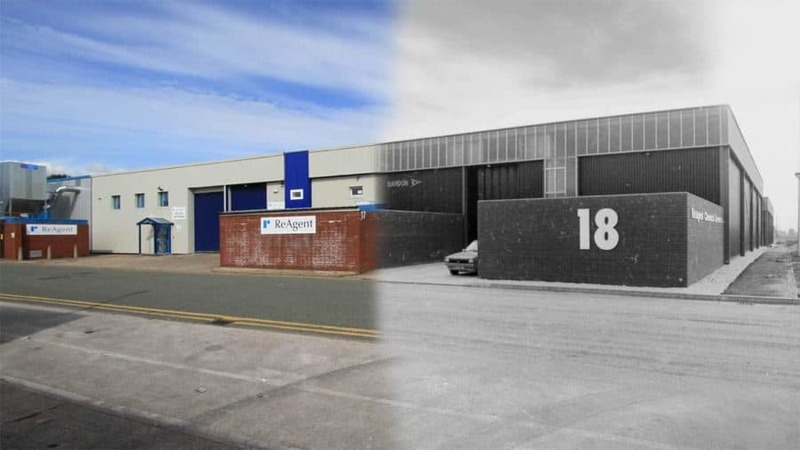 These years saw many significant changes within the organisation, with new premises and increased staffing levels to meet customer demand. As Managing Director Steve grew the customer base and built up close working relationships, many of which continue to this day. Barbara led the company through a rebranding exercise and ReAgent Chemical Services Limited became ReAgent, with a new logo and branding. Barbara also developed ReAgent’s ongoing commitment to its staff as a fair and responsible employer and embarked on becoming an accredited Investor in People (IIP) which status it achieved in 2006. Steve Hudson (centre) accepts our first Investors In People Award in 2006. Second from left is his son and future MD, Richard Hudson and to the far right is Barbara Hudson. Steve and Barbara’s son, Richard Hudson became Managing Director of ReAgent in 2009 and the company’s growth since that time has been tremendous. Richard’s background as a Chartered Marketer has led to a radically efficient way of working with heavy investment in a new IT infrastructure within the organisation and many new systems and processes in place. The company has purchased additional premises and has continued to increase its staffing levels to become one of the leading and most highly respected chemical manufacturers and suppliers within the UK. ReAgent is proud of its green credentials and has become accredited to ISO 14001:2004 Environmental Standard and is working towards BS OHSAS 18001 Occupational Health and Safety Management. With exciting plans for development and expansion into Europe and beyond, Richard has ensured ReAgent’s continued growth into the future for the benefit of its employees and customers alike. Take a look at the major milestones in ReAgents history over at our blog for even more information on our History. "We received an excellent level of service from ReAgent and were particularly impressed with their after sales support"
The 1,000mph Land Speed Record Attempt. Find out more about our products and services in a handy downloadable document. Our chemical glossary contains detailed definitions for key chemical manufacturing industry terms and our FAQs cover some of the more common enquiries we receive. How can ReAgent help you? "All enquiries are treated as confidential - we never share your details"
"We provide comprehensive technical support with every enquiry"
"Our manufacturing facility is accredited to ISO 9001 and ISO 14001"